I have a Whistler TRX-1 Police Scanner and live in New Bern, NC. There are two systems that I track in New Bern. The New Bern Public Safety (NBPS) and North Carolina VIPER system. VIPER works great however the New Bern Public Safety……..not so much. It only rarely grabs a transmission and then if it does it is very broken up or robotic. Not good. This entry was posted in Scanner on September 19, 2018 by John Hagensieker. Thanks to TV reporters pretending the storm was a lot worse than it was the entirety of the free world thinks that all of New Bern is destroyed and is now just like the Lost Colony of Roanoke. I’m not trying to minimize the damage to New Bern as it was substantial but New Bern is a Semi-Large Small Town and everyone doesn’t own a home or business on the River. Basically the Hurricane created HARD days all of Thursday and Friday with some wind and rain on Saturday but no so bad that you couldn’t perform your recovery actions. This entry was posted in Uncategorized on September 16, 2018 by John Hagensieker. As Barry Manilow said……….”Looks like we made it”. The hurricane is over but the aftermath lingers on. This is me at 2AM. What a fella won’t do for coffee. When times are hard having your favorite beverage helps tremendously. I can’t stress enough what a morale booster it is. 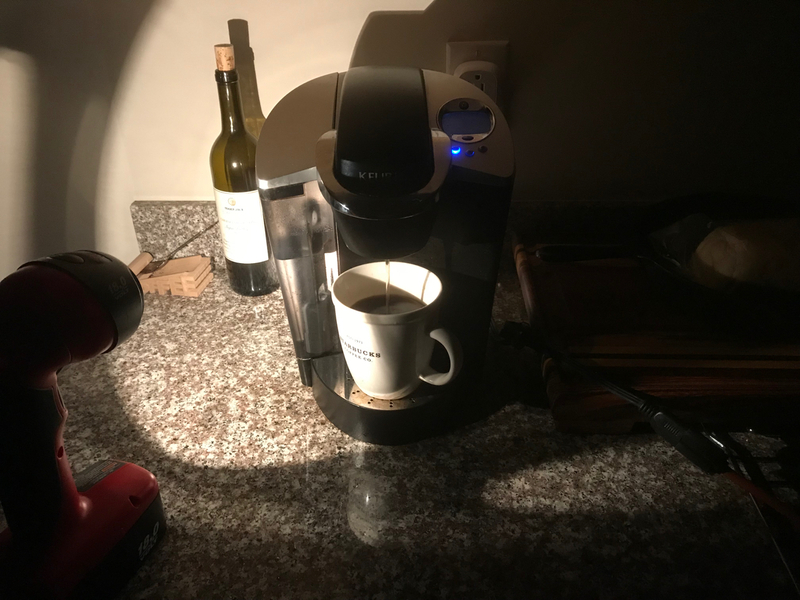 Day 3 of no power begins. I have a full generator tank and 10 gallons of gas left. I also have 1 inverter generator with about half a tank and THREE more waiting that says I can keep the fridge on a few more days. This entry was posted in Uncategorized on September 15, 2018 by John Hagensieker. Today is the day we find out if I’m as prepared as I think I am. While it no longer seems to be a direct hit it does seem like we are JUST outside the hurricane force wind zone and will be in the Northeast Quadrant of the storm where the heavy rains are. Some forecasts show 20-40 inches of rain in this area which will cause massive flooding. I fully anticipate our neighborhood will get cut off. I’m an RTL-SDR geek and in a pinch that means when the NOAA satellites fly by I can download the Automatic Picture Transmission signal (APT) directly from the satellite and receive real time telemetry. That’s pretty cool I think. Here’s one from Sep 12th in the late afternoon. This entry was posted in Uncategorized on September 13, 2018 by John Hagensieker. Hurricane Florence coming! You’ve all seen weather radios and you’ve all seen they generally cost $50 or more. On a good day you can find one for $35 or so. The goal is to receive NOAA which transmits on the following 7 frequencies. There will be one or two specific to your area. The frequencies below are in MegaHertz (MHz). 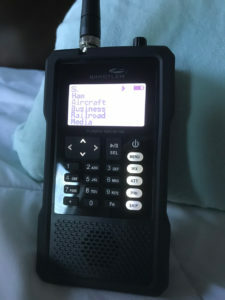 This entry was posted in SDR, Software on September 10, 2018 by John Hagensieker. So at this point it is safe to say I’m a police scanner junkie. This started with my love of Software Defined Radio (SDR) devices. You get an SDR then you tune to FM stereo, then you track aircraft ADSB, then somewhere along the lines you start listening to anything you can which includes emergency services stuff. First you just listen to analog police, then you find out there are digital trunked systems. That evolves into using programs such as DSD+ with Unitrunker or another program called SDRTrunk or OP25. Then you realize that you’re into hardware scanners. I started out with a Uniden SDS100 which is probably the most technologically advanced consumer grade scanner on the market at this moment. It probably unseated the Whistler TRX-1. If you read the forums there is kind of a Ford/Chevy thing going on with Uniden/Whistler. I had to see what all the fuss was about so I got the Whistler TRX-1. This entry was posted in Scanner, Software on September 2, 2018 by John Hagensieker.